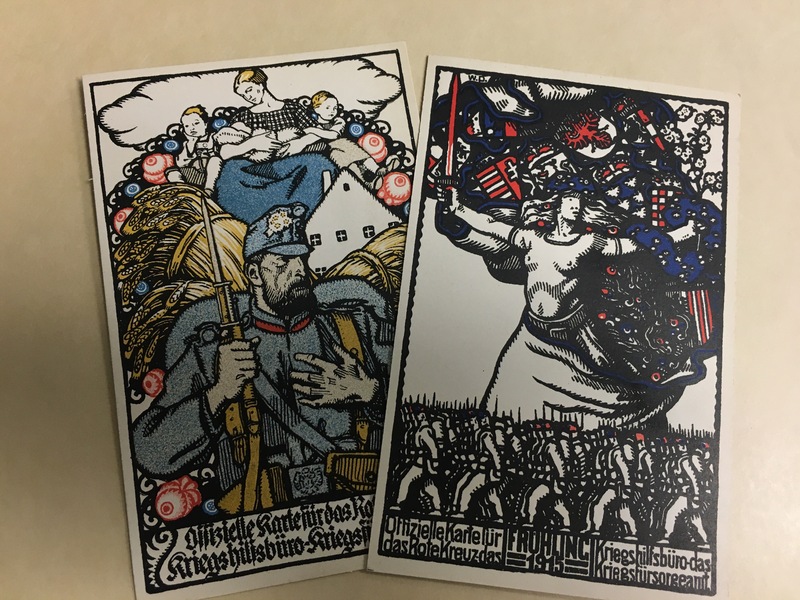 When it comes to archival collections, I almost always fall in love because I am forced to look at something in an entirely new way … the Paul Schrecker collection of Austrian World War I ephemera is no exception. 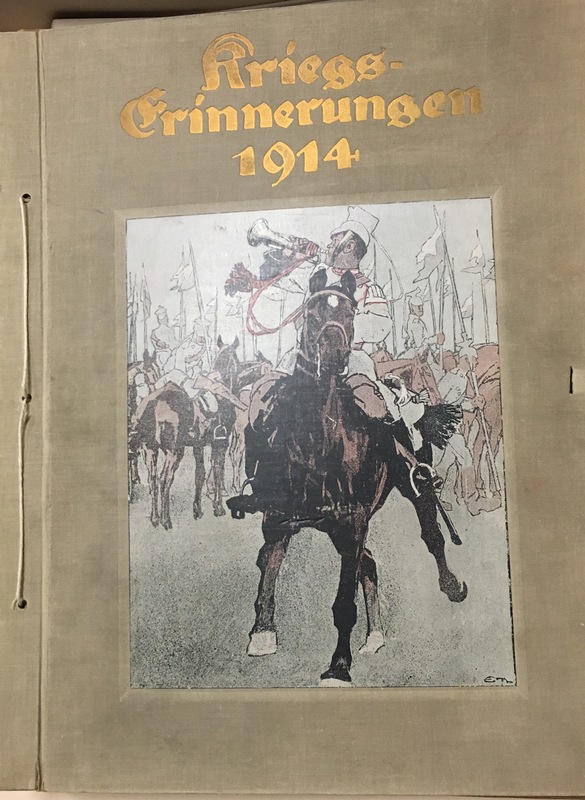 This collection documents a Viennese man’s experience on the home front during World War I. I have not really had the opportunity to work with primary sources from the Central Powers’ perspective. The American perspective, sure! And with some frequency, the British and French perspective too! This collection was an absolute treasure trove of stuff folded up and squashed into an old scrapbook called Kriegserinnerungen 1914 (War Memories). Nearly every item in this collection is illuminating, but what struck me over and over again was the cost of war … not just in lives (around 40 million), which goes without saying, but the financial cost of war and the efforts Austria made to afford such a catastrophic event. It appears to me that Schrecker, in addition to recognizing the monumental effect the Great War would have on history, was supporting his country and the war effort by purchasing items produced for those purposes. It appears that his brother was a civilian prisoner of war held at the Alexandra Palace in London, so the need to support the war effort was not only patriotic, but also personal. As I began working with the collection, I noticed that a number of items were issued by Rotes Kreuz, Kriegshilfsbüro, Kriegsfürsorgeamt) (the Red Cross, the War Support Office, and the War Welfare Office). According to my research online, the War Welfare Office was established in 1914 to “alleviate the plight of war victims – soldiers and surviving families,” (Wikiversity). 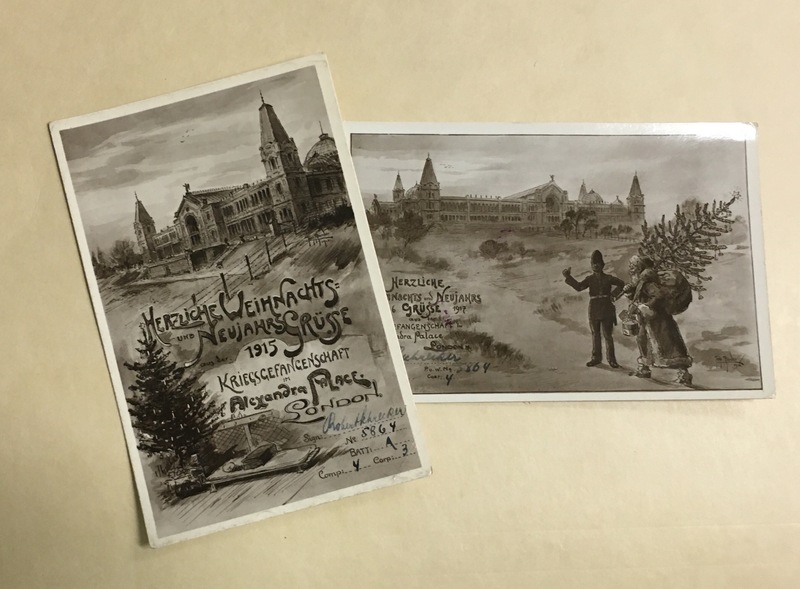 The organization sold postcards (between 2000 and 2500) a few of which are in this collection among a larger selection of postcards. The War Welfare Office postcards in this collection (numbers 9, 10, 11, 143, 145, 149, 150, 234, 502, 542, 547, and two unnumbered) document battle scenes, military leaders, Franz Joseph, and patriotic images. 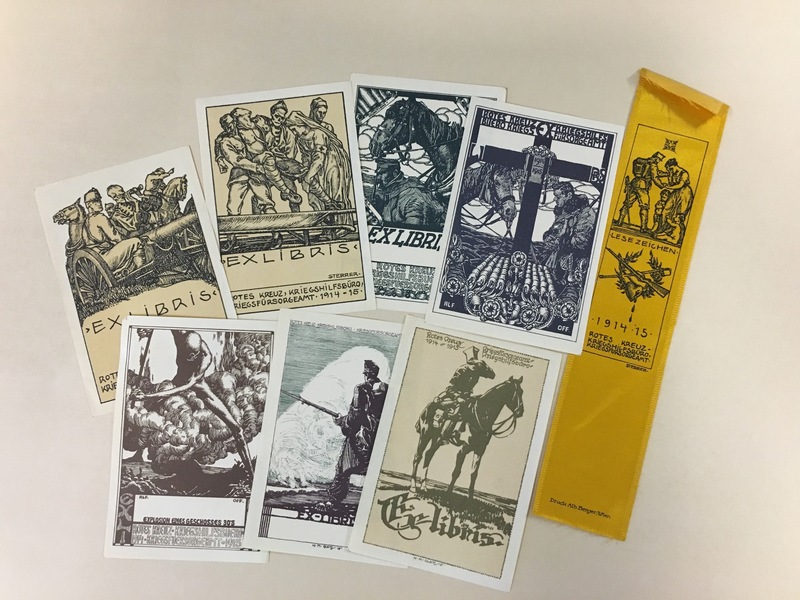 This collection also contains some absolutely amazing bookplates and a book mark issued by the Red Cross, the War Support Office, and the War Welfare Office. We have fifteen bookplates, but none of my research comes up with more than two in any one other collection, so I cannot be certain if we have a full set. Artists Karl Sterrer, Alfred Offner, Hans Maria Glatz, and Richard Moser created dramatic and sometimes disturbing images. 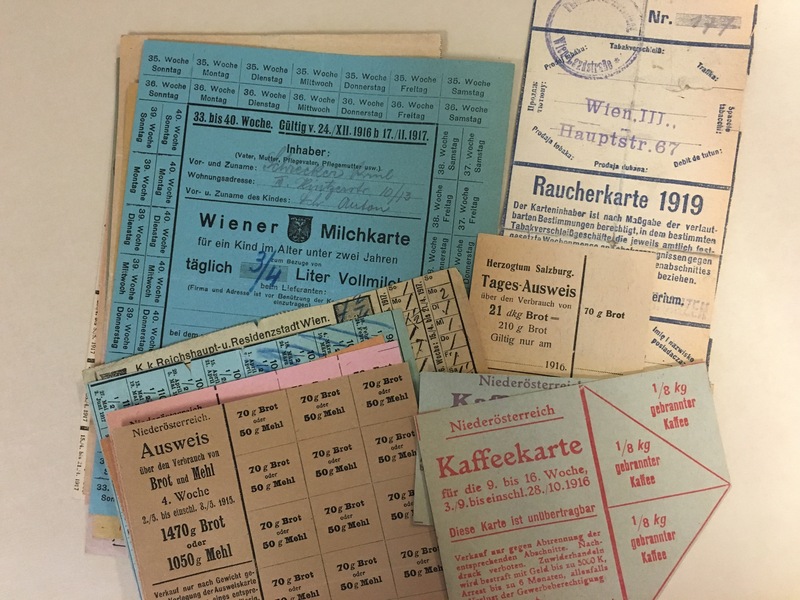 In addition to publications memorializing World War I that were published before the war was over (probably sold to bolster funds) and numerous subscription documents and requests for donations, the collection contains ration cards dating from 1915 until 1922. Bread and flour, milk, sugar, and coffee were rationed throughout the war, but tobacco appears to have been rationed even after the war with one card from 1919 and another from 1922. A fascinating (and confusing) document shows the hoops jumped through to claim a pair of shoes! Despite his loyalty to his country during the Great War and its aftermath, with the passing of the Nuremberg Laws, Schrecker, a Jewish professor and a philosopher, was dismissed from his position at the Prussian Academy of Sciences in Berlin and fled to Paris where he taught at the University of Paris from 1933 to 1940. He moved to the United States after the German occupation of France in 1940. He taught in New York and at Bryn Mawr, Haverford, and Swarthmore before coming to Penn in 1950 where he remained until his retirement in 1960. This entry was posted in Manuscripts, Uncategorized, World War I by Holly Mengel. Bookmark the permalink.